Allan Burgess with a landlocked salmon caught trolling in Lake Coleridge, Canterbury high country. 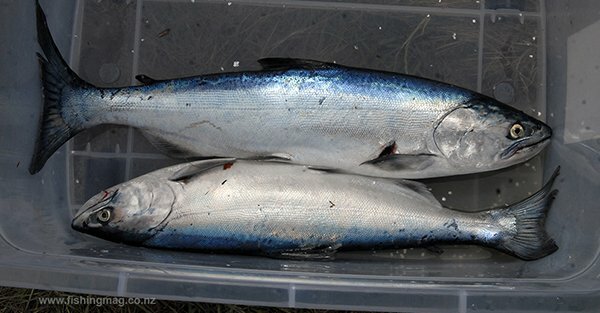 They are good fighters and will take almost any lure – though bibbed minnows seem to work the best for trolling. 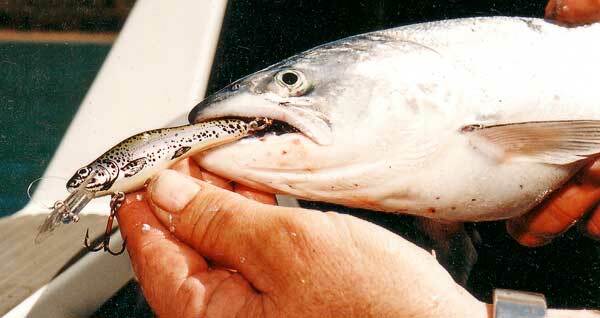 Landlocked Quinnat Salmon are regularly released into various South Island lakes by Fish & Game. Aside from Lake Heron, in the Ashburton group, landlocked salmon fisheries in New Zealand are entirely supported by artificial stocking. These hatchery-reared salmon only live for a few years or so. Landlocked salmon are the same species of Quinnat salmon that return as sea-run fish to our South Island east and west coast rivers over summer and autumn to spawn. Landlocked salmon are released (stocked) into the lakes by Fish & Game. They do not spawn successfully before dying. Landlocked salmon tend to swim in schools. The food supply for them in Lake Coleridge isn’t very plentiful so that don’t grow that big. Most reach only a kilo or two at most. Though anglers occasionally catch a larger one. The shoaling behaviour often leads to multiple hook-ups. There may be nothing happening for the shore anglers fishing the “picket-fence” then suddenly fish are hooked by several anglers at once! A good size Lake Coleridge landlocked Quinnat salmon taken on a wet Opening Weekend. Salmon trapped in lakes are voracious feeders and will tend to hit almost any lure that comes near them. For this reason, the catch in Lake Coleridge, for example, is dominated by landlocked salmon, followed by lesser numbers of rainbow trout, and browns making up a distant third place. Landlocked salmon will also readily take fluorescent lures at night that have been powered-up to glow with a touch. They are good fighters and make good eating – though possibly not quite as good freshly caught sea-run salmon which must surely rank as one of the best-eating fish in the sea! 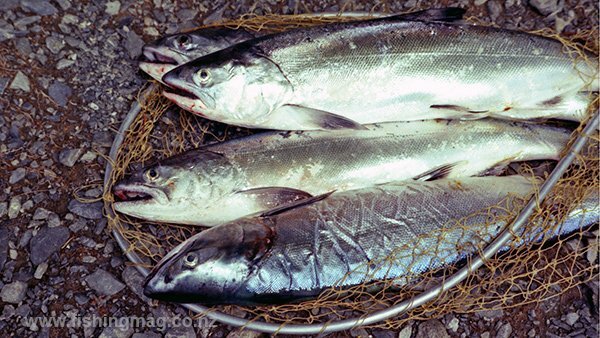 Land-locked salmon are bright silver in colour with a blue tinge on their backs. This is a typical colouration of schooling land-locked salmon. They will readily take trolled or cast lures. It is not unusual for several anglers to hook-up in quick secession when a salmon school is encountered. It is important to keep casting when fishing from shore so that your lure will be in the water when a school happens along! 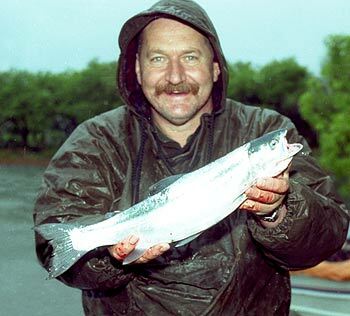 Rainbow Trout or Landlocked Salmon They can look very similar when caught in lakes. How to tell the difference between land-locked salmon and rainbow trout in lakes. Is this a trout or a land-locked salmon. Here’s how to tell the difference. There are also landlocked salmon in Lake Coleridge, Heron, Sumner, Wakatipu, Wanaka, and Hawea. See photographs of salmon smolt being released at the Montrose Fish & Game hatchery, Upper Rakaia River. Advice on how to catch a land-locked salmon from shore on spinning gear in Lake Coleridge. The morning’s catch by two anglers trolling on Lake Coleridge. Note how the landlocked salmon are a uniform size. These landlocked Chinook salmon shoal in lakes. Several anglers will often hook-up at the same time. Landlocked salmon caught by Allan Burgess in Lake Coleridge. The two fish pictured at the top are typical size of landlocked salmon from this lake. The bottom fish is clearly much larger. Unfortunately, I can’t now remember its weight. Land-locked salmon from Canterbury’s Lake Coleridge. These land-locked fish are bright silver in colour with a blue tinge on their backs. This is a typical colouration of schooling land-locked salmon. They are very good to eat though clearly the aquatic food supply available to these fish in Lake Coleridge is nowhere near as good as that available to salmon in a marine environment. Four landlocked salmon from Lake Coleridge in the Canterbury high country. Lake trolling is popular and effective where there are populations of landlocked salmon present. They seem to hit lures quite readily. Pictured: Trolling on Lake Coleridge. This landlocked salmon has taken a Jensen Fingerling bibbed minnow trolled with the aid of a downrigger. Though most landlocked quinnat salmon don’t grow larger than 1.5 kg they are good fighters, and will readily take a wide range of cast and trolled lures. They are also very good eating. I fish for them on 6 lb monofilament. They also seem to swim around the lake in schools.